I feel as though I've been cooking in a time warp. For some reason or other, I had a can of wild salmon on hand -must have read about it somewhere that it's good for you, better, in fact than canned tuna; salmon is full of good fats and omega 3's. So the other night I knew I needed to prepare a Temple/Shul-friendly protein option for my daily lunch. It's the continual struggle to balance my healthy eating habits with the Kosher rules of my workplace. It really is too bad that I'm not a full-on vegetarian, meal planning would be so much easier for work. Since I remain a pescatore, carnivore and omnivore I don't see I'll be changing my animal protein ways any time soon. Don't shoot me with a blowdart - it's just how I am. Back to the point, I wanted to make salmon cakes with the canned salmon - a definite throw back to my childhood days. Funny thing is, my mom didn't make them back then - I did. 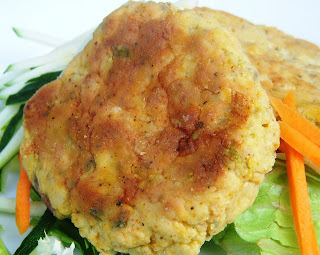 One of my earliest cooking memories is of making salmon cakes. I had this yellow Betty Crocker Recipe Card Library box I found somewhere, with file cards in categories: "Gifts From Your Kitchen"; "American Classics"; "Come for Coffee" and my favorite, "Entertaining on a Shoestring." I still have the recipe cards, though it's not the original box from my childhood - it's from Liz's family's collection. When we found the box, all the cards were in order and one was still in it's original cellophane packaging, never opened. We still laugh about this, as the cards were, "Men's Favorites". Apparently, Liz's mother did not feel compelled to make these man-pleasing treats. The old recipe calls for using I'm sure, high-fatty stuff like left-over mashed potatoes and breadcrumbs and mayo. Recalling the better salmon cakes I used to make when I worked at Andro's in the Reading Terminal, I knew there was a more gourmet version I could use. Keeping them healthy was/is my main concern. If you have some fresh salmon - by all means, add it to the canned salmon, it makes the end product taste so much better. We used to use the salmon scraps from whole sides that I would break down into smaller portions. Adding the cooked scraps to even the best canned salmon will make the salmon cakes taste fresher. Fresh lemon juice and zest also add a bright flavor. These salmon cakes were baked. There's less mess, fuss and fat to worry about. For easier handling, I used a small, 4 ounce spring loaded ice-cream scoop to form my cakes. After I scooped the salmon, I placed the rounded mounds into seasoned flour to dredge and pressed them down into patties. Prheat oven to 350 degrees. Prepare a sheet tray - line with parchment paper, aluminum foil or a silpat. Coat the lined tray with oil, spreading the oil over the entire lined tray. Set aside. Add the drained salmon to a large mixing bowl. Mix in the grated carrot and minced celery. If using the cooked potatoes, smash them, with skins on, and add to the salmon mixture; otherwise gently fold in left-over mashed potatoes. Next, add in the lemon zest and juice, Dijon mustard, egg, salt, freshly ground pepper and paprika. Mix together to bind and incorporate, but do not over-mix. Scoop out the salmon using an ice cream scoop and dredge in seasoned flour - gently pressing each mound down into a patty. Place the salmon patties onto the prepared sheet tray. When all the salmon cakes are made, bake for a total of 25 minutes at 350 degrees; flip the salmon cakes over to brown both sides, after 15 minutes, and continue to bake for the next 10 minutes. Makes 8 four ounce salmon cakes. Serve hot, warm or cold. These will taste great with a side of light sour cream and cucumber, ranch dressing or honey mustard.